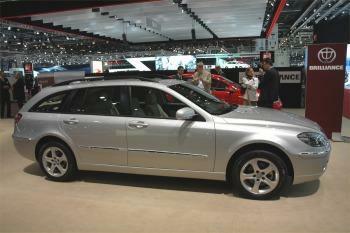 is showing the BS4 wagon in Geneva. Despite a series of crash test and homologation setbacks, Chinese car maker Brilliance is pressing ahead with its plans to sell cars across Europe. And Hans-Ulrich Sachs, managing partner of the company’s European distributor HSO Motors Europe, believes the company will make real progress in 2009. In 2008, Brilliance’s first full year of European sales, around 1,000 cars were sold in Brilliance’s launch market, Germany. These were all Brilliance BS6 and BS4 large saloons. But this year, the addition of a BS4 wagon and the smaller BS2 hatchback, currently on show at the Geneva Motor Show in a “close to production version”, should propel sales to around 6,000, Sachs believes. The BS2 has been shown as a concept car before – but the BS4 Wagon made its debut at Geneva this year. It’s powered by 1.8-litre engine, driving the front wheels through a six-speed gearbox. A 2-litre version will also be available –these powerplants have been developed by Brilliance in cooperation with FEV. Styling is by another Italian carosseria – Pininfarina. It’ll be priced between €18-20,000.